A game they call ... "Breath Play" "The Choking Game" "Choke out" "The Pass Out Game""Black Out" "Bagging" "Space Monkey" "Flat Liner" Tingling and Suffocation Roulette" "Funky Chicken" It is just a KILLER!!!!!! This picture was taken on Nick's camera at Summer Camp in July 2004. 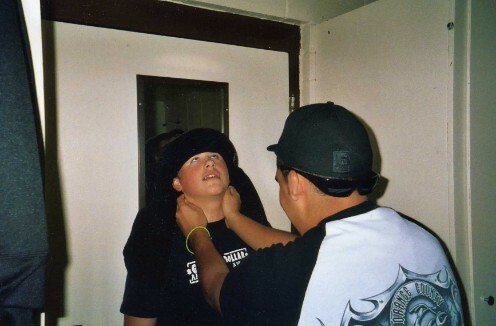 The boy being choked is Nick. I saw the picture when he got back and I asked him what the heck is this? He told me they were messing around and made it out to be "Not a Big Deal" I gave him a 30 minute lecture on how stupid that was and I could not believe he would ever take part in something so dumb. I told him that passing out like that could kill brain cells and he needed all of his. I made him promise me he would not EVER do that again... He PROMISED... The picture disappeared and I never gave it another thought until that HORRIBLE DAY in January. I found this picture hidden away in a book in his room.. I DIDN'T KNOW THIS WAS SOMETHING THAT A KID COULD BECOME ADDICTED TOO!!!!! I HAD NEVER HEARD ABOUT THIS "GAME" !!! If I knew then what I know now it would have made a difference in what I would have done to STOP HIM. My goal is to make sure all parents know about this and they can have a chance to make a difference in their child's life. The following is information that I have learned since Nick's passing.. I think it is something all kids and parents should know about. I wish I had known more about this before I lost my baby. There is a game that the kids play ... They call it "Breath Play" "The Choking Game" "Choke out" "The Pass Out Game""Black Out" "Bagging" "Space Monkey" "Flat Liner" Tingling and Suffocation Roulette" "Funky Chicken" . It is usually played in groups where they hold each others necks until they are ready to pass out. It apparently gives them a drug-less "High" a "Rush" that is addictive. I have talked to kids that have done this in their classrooms at school or anywhere there are groups of kids. Some kids think they can do this on there own if they want that "Rush". They will use belts, ace bandages, ropes, etc. to cut off their oxygen and think they can control it.. Some use plastic bags and suffocate. Some kids think they are bulletproof and nothing bad will happen to them... My son, like most other teenagers thought he could do anything and it wouldn't hurt him... BIG BAD DECISION! Nick used an ace bandage to play that last day and I am sure he thought he could pull it away when he reached that point. "That point" is just a split second.... It got away from him and he asphyxiated himself. He slumped face down on the floor and died. He couldn't call for help, he couldn't help himself, and he paid the ultimate price...his LIFE for a silly game. This "Game" is not fool proof, if you play this game it proves you are a fool! You need to breath!! If you go 5 minutes without oxygen there is NO turning back. All of your organs shut down, your life is over. It is not a joke. It has caused brain damage to some kids that are lucky enough to have someone walk in on them... PLEASE DO NOT MAKE THIS SAME MISTAKE!!! It doesn't just effect you.. I effects your whole family and all those around you.. It is devastating to loose a child... I beg you all to please use the brain GOD gave you and don't make this Bad Decision. If someone at school or anywhere else is wanting to play this game please report them to an adult... You may save their life. It is important that parents know what to look for.. I saw signs but didn't know what they were.. We snooped through our sons room regularly to make sure he was always on the right track.. If I would have known there was an addictive "GAME" like this one and what the signs were I could have taken other actions.. I just pray that this will help someone else to see it and it save a life..
2. Looking 'groggy' when coming out of their room. 3. Having plastic bags, ropes, belts, etc.. in their room. 4. Look for marking on the neck. 5. They think they are "Bullet proof"
6. Hang out with a good crowd.